Steampunk is H.G. Wells and Jules Verne. It is leather and buckles. It is industrial and gritty. Steampunk, the theme for Durango’s 2015 Snowdown festival, which will begin Wednesday, is perhaps best described as a Victorian vision of the future. 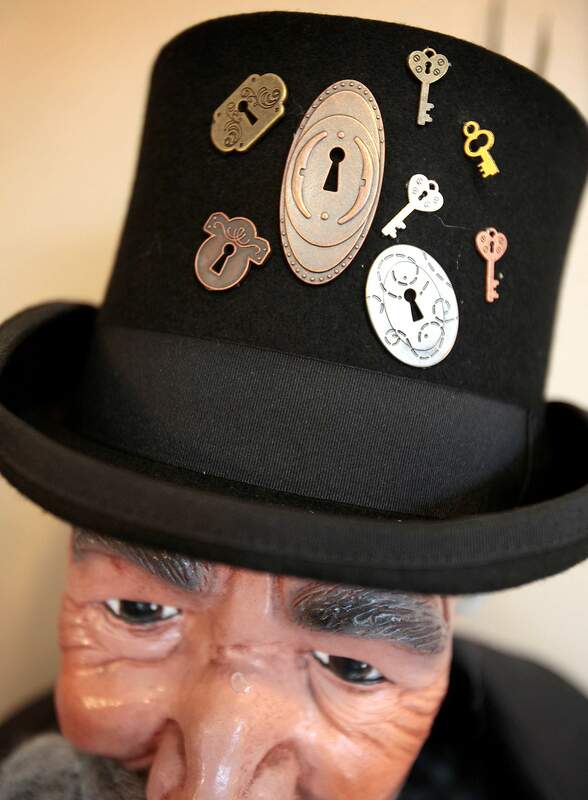 “I guess what comes to mind is top hats, goggles, 20,000 Leagues Under the Sea – an amalgam of the Victorian and the industrial,” said Shay Lopez, an artist with Durango’s Studio & gallery. 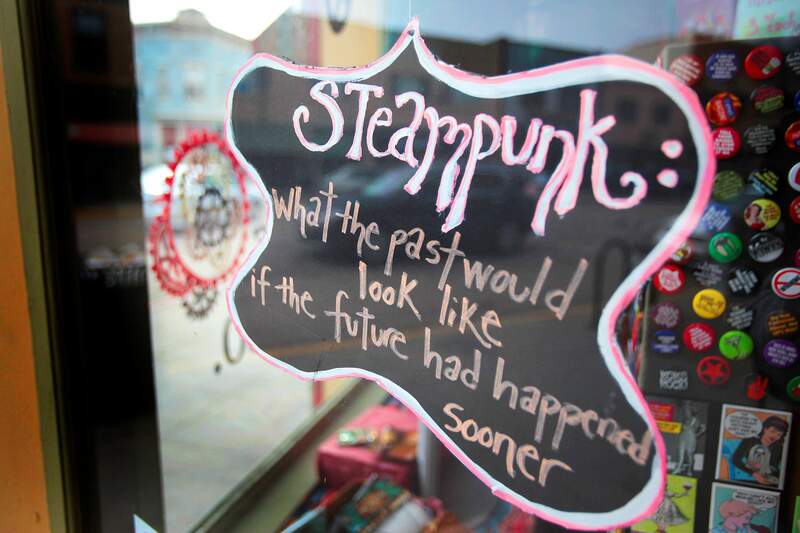 Steampunk seems a natural fit for Durango, a Victorian city that owes its beginnings to heavy industry. “We have the train, we have Victorian buildings still – and Durango loves its costumers,” said Dawn James-Staten, president of Snowdown’s board of directors. Choosing Snowdown’s theme has become more important as the winter festival has evolved from a locals’ rebellion against cabin fever to a major five-day event that draws thousands. Downtown sidewalks are replete with sandwich boards advertising shops’ steampunk-themed costumes. The steampunk theme was not an initial favorite of Snowdown’s organizers. Snowdown board members ruminated on the steampunk theme for years. Eventually, the board agreed to it in fall 2013 during an annual camping retreat to Navajo Lake. “It took the board a little time to wrap their brains around it and understand what it is,” James-Staten said. Steampunk dovetails with other pop-culture trends that celebrate affectations such as waxed mustaches and tweed bicycle rides. Trendy bars have menus brimming with pre-Prohibition bourbon cocktail recipes. Last March, The New York Times published a much-derided story declaring the comeback of the monocle as fashion accessory. Steampunk inevitably means romanticizing the past. There are other things from the Victorian era that Snowdown won’t be celebrating, from child labor and Jim Crow to diphtheria and smallpox. Lopez said there’s something disquieting, even post-apocalyptic, about the steampunk aesthetic. “There’s a decay or something dark in all this industrial stuff being reused or repurposed,” he said. The steam-powered Durango & Silverton Narrow Gauge Railroad is Durango’s most obvious link to the steampunk aesthetic. The Denver & Rio Grande Railway completed the track in 1882 to haul gold and silver ore from the San Juan Mountains. “Certainly, the train is very steampunky, which is cool,” said Kris Oyler, co-owner of Steamworks Brewing Co. and El Moro Spirits and Tavern. El Moro, which opened in 2013, exudes the steampunk aesthetic. Ceiling fans are linked by pulleys; the bathroom sink is served by long, twisting copper pipes. Oyler grew up watching the TV series “The Wild, Wild West” with Robert Conrad. “That was, in my mind, my original view of steampunk,” he said. Oyler said he was at work on his costume, which he described as a steampunk twist on Sheriff William J. Thompson, who was killed in a shootout in 1906 at the site of El Moro in the 900 block of Main Avenue. Costumes may be more unusual this year than with some past themes. Shanan Campbell Wells is hosting the Steampunk Soirée on Jan. 31 at her Sorrel Sky Gallery to benefit the Mercy Health Foundation. She said she likes this year’s steampunk theme. The steampunk theme makes it easy for Snowdown celebrants of any age to join in, Campbell Wells said. She pointed to another practical consideration. “It’s also very appropriate for winter if it’s cold,” she said. What is Steampunk What exactly is steampunk and out to be properly equipped for this years Snowdown. What exactly is steampunk and out to be properly equipped for this years Snowdown. Expect to see plenty of goggles during next week’s steampunk-themed Snowdown. 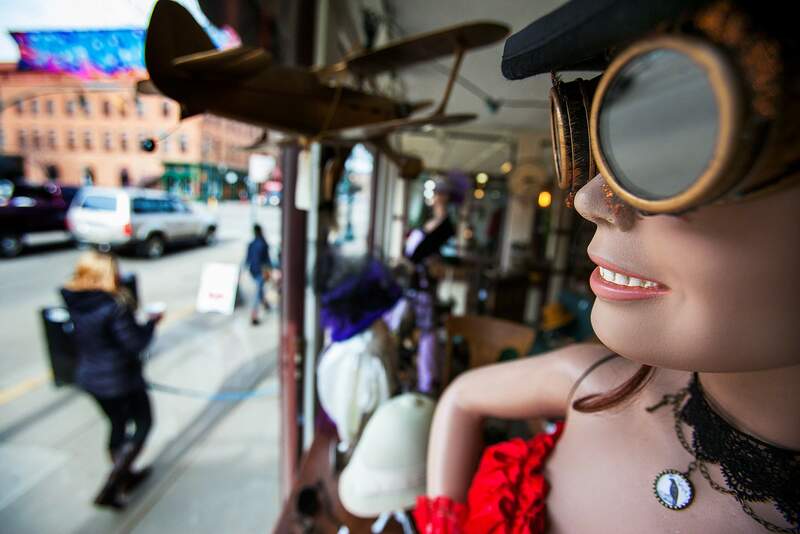 This mannequin at the Durango Antique Market is one of many signs in downtown Durango that the annual winter festival is about begin. Events kick off Wednesday. 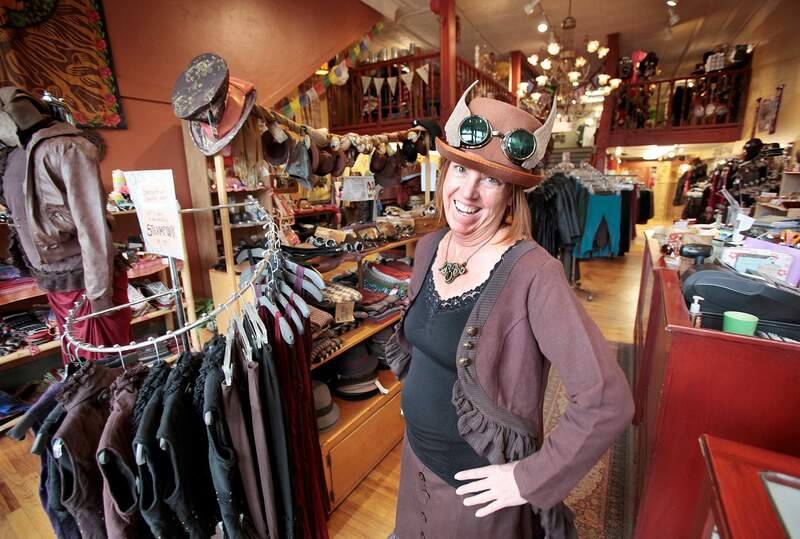 Cathy Wakeman, owner of Animas Trading Co. on Main Avenue, displays steampunk style, which is inspired by the Victorian era. Steampunk can be described as the Victorian vision of the future. 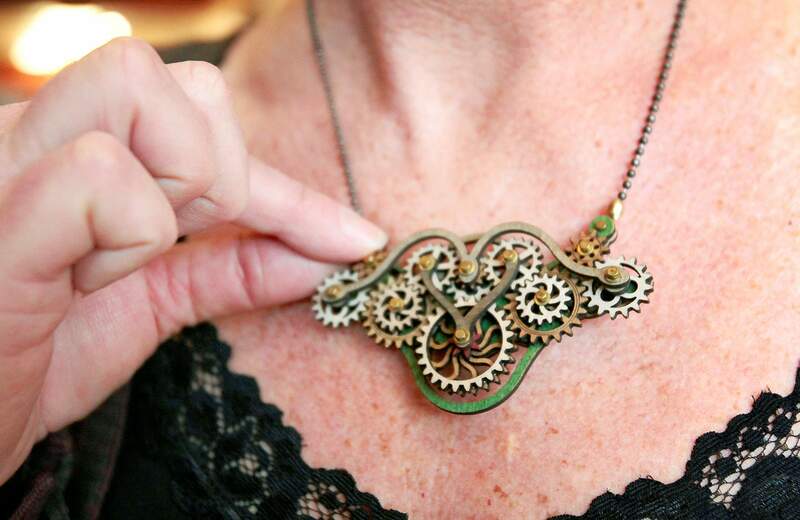 Cathy Wakeman, owner of Animas Trading Co. on Main Avenue, shows off a steampunk-style necklace. This steampunk-style hat at the Durango Antique Market recalls the Victorian era, which serves as inspiration for the steampunk aesthetic.